Motown guitarist and Funk Brother Eddie Willis has fallen on hard times. Detroit-based drummer Drew Schultz has released an album to raise money for the legendary musician. From the humble beginnings of Motown Records in 1959 to the company’s expensive and controversial relocation to Los Angeles in 1972, one set of musicians played on nearly every hit record that the company produced. Known collectively as The Funk Brothers, these musicians would develop the famed ‘Motown Sound’, providing track after track of musical brilliance from which the careers of Motown’s top stars would be launched. The ensemble included leader Earl Van Dyke on keys, Benny Benjamin on drums, James Jamerson on bass, Jack Ashford on tambourine and vibes, Eddie ‘Bongo’ Brown on bongos and congas, and Robert White, Joe Messina and Eddie Willis on guitars. It was these central figures, along with bassist Bob Babbitt, drummers Uriel Jones and Robert “Pistol’ Allen, Joe Hunter and Johnny Griffith on keys, that would serve as Motown’s house band in the sixties and early seventies. Together the group would play on more number one records than Elvis Presley, The Beatles, The Rolling Stones and The Beach Boys combined. But, unlike the acts recording vocals for the tracks The Funk Brothers created, the musicians were only paid per session, and were largely unknown to the record buying public. To prevent them being lured away from Motown, the musicians identity was somewhat hidden by the company, until Marvin Gaye printed their names in gratitude on the album sleeve of his What’s Going On masterpiece. With such a great collection of musicians able to produce quality soul, R&B and pop, Motown clung to The Funk Brothers as much as possible. Motown discouraged them from performing for other studios in Detroit, and resisted their attempts to perform in Detroit’s night clubs. Yet, for all their control over the musicians, when Motown left Detroit in 1972 The Funk Brothers suddenly found themselves to be expendable. Several of the musicians would relocate to Los Angeles, but many stayed in Detroit and played local gigs and recording dates. It wouldn’t be until 2002 that the surviving Funk Brothers would receive greater recognition for their contributions to Motown and the Motown Sound. The surviving members were reunited by documentary maker and writer Allan Slutsky, to tell their story of working at Motown, and filming live performances with a host of soul star. The result was the film ‘Standing in the Shadows of Motown’, a documentary shown around the world tracing the highs and lows of being Motown’s in-house hit-producing machine. The success of the documentary led to a Grammy for their version of ‘What’s Going On‘ with Chaka Khan, and a world tour. Yet, the group saw no royalties from the success of Standing in the Shadows of Motown, and several members have passed away in recent years. Tensions also developed between certain members, with different members touring with different incarnations of ‘The Funk Brothers’. Today, Eddie Willis, one of the group’s guitarists is suffering from polio at the age of 81. His wife has recently been the victim of a terrible dog attack, leaving her in desperate need of reconstructive surgery. Money is tight for the Willis household. To help with the Willis’s medical bills and expenses, drummer (and friend of TFSR) Drew Schultz has released a mammoth 33 song tribute album to Willis, with all proceeds going directly to him. 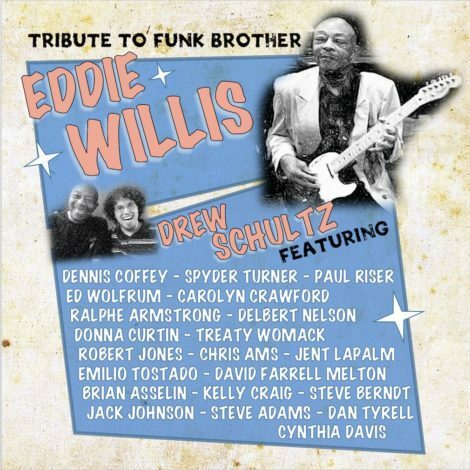 The album is a live recording of a show Schultz put on back in 2013: the show was a fundraiser for Eddie Willis, and featured an excellent array of Detroit talent covering well-known and well-loved Motown classics, as well as some more deeper cuts from The Funk Brothers archive. 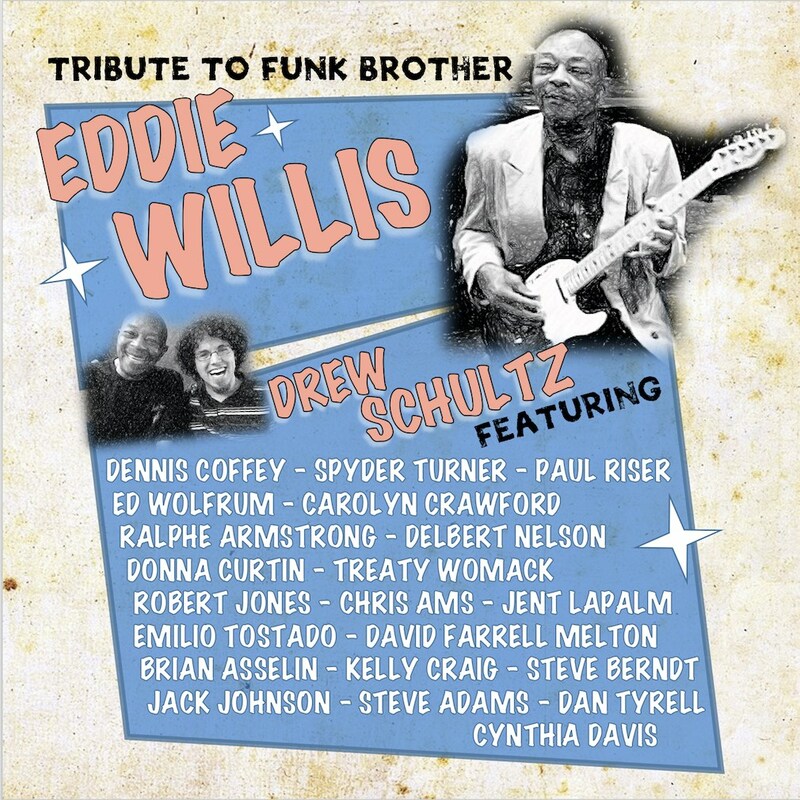 The album cover for Drew Schultz’s tribute to Funk Brother Eddie Willis. The album boasts an incredible line-up of talent. Schultz and his band The Funk Machine, the group’s name being an obvious nod to the The Funk Brothers, provided musical backing for the show. They prove to be an able set of musicians who replicate the Motown sound with genuine authenticity: this isn’t a mere tribute to the best of Motown, the band are clearly knowledgable of Motown’s rich history and are able to produce these classic soul songs with style. Joining The Funk Machine on stage included the excellent soul singer Delbert Nelson, who toured with The Funk Brothers after the release of Standing in the Shadows of Motown documentary (and featured on an album with The Commotions). A gruff soul singer in the mould of David Ruffin and Levi Stubbs, Nelson delivered great performances on The Temptations classics ‘Get Ready’ and ‘I Know (I’m Losing You)’. Carolyn Crawford also joined The Funk Machine that night, singing a great rendition of Gladys Knight & The Pip’s final Motown release, ‘Neither One of Us (Wants to be the First to say Goodbye)’. Crawford originally recorded at Motown in the early sixties, signed to the label when she was just fourteen. While she never reached the same heights as other female Motown singers, she did release some excellent material – including the brilliant ‘My Smile is Just a Frown (Turned Upside Down)’. Other contributors include Ralph Armstrong, a bassist for the Mahavishnu Orchestra and who was also a protege of bassist James Jamerson, Motown legend Paul Riser who arranged many of the horns and strings on many classic Motown songs, Spyder Turner, a legend on the Northern Soul scene, and Ed Wolfrum, a studio engineer who worked with The Funk Brothers. However, perhaps the biggest coup for Schultz, is the appearance of guitar hero Dennis Coffey. Coffey is a famed session guitarist who recorded on many of the later sixties Motown hits, and is credit as brining the wah-wah sound to Motown. On the album Coffey performs an outstanding version of his instrumental hit Scorpio, which featured several members of the Funk Brothers on the original recording. 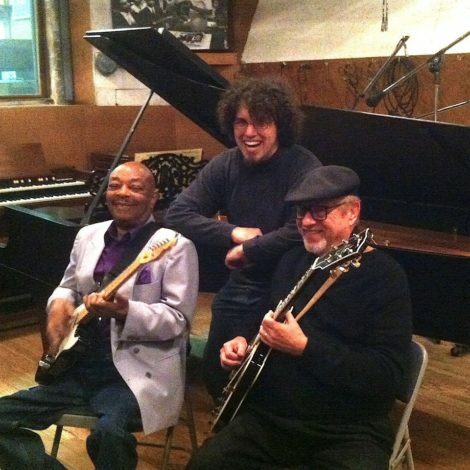 Eddie Willis (left) with Drew Schutlz (middle) and guitarist Dennis Coffey (right). Photo credit: Drew Schultz. All in all, the album is a spectacular live recording, packed full of Motown classics and Funk Brothers rarities (check out ‘Fever in the Funk House‘). It’s also well worth your money: the album clocks in at just under two hours long. Particular highlights for us include a thumping version of Junior Walker’s ‘Shotgun‘, a seductive rendition of the Marvin Gaye classic ‘Let’s Get It On‘, and a performance of the Drew Schultz original ‘Take It Slow’, the original of which featured a guitar break from Willis himself. Drew Schultz has clearly produced this album with a lot of love. It’s a beautiful gesture to release such a stunning album to raise money for a man who has helped to create some of the best music ever recorded. One of the great tragedies of Motown was that it’s musicians never got the credit that they deserved while they were at their creative peak. Even with their later success, it’s sad that one the architects of the Motown Sound is struggling in his later life financially. Here’s hoping the album is a success, and maybe some former Motown stars can chip in to help Eddie Willis live out the rest of his life in comfort and financial stability. You can purchase the album on iTunes and Google Play. Check out Drew’s Facebook page for more information and photos.